Excuse me? You haven’t made my Blanquette de Porc? It’s one of the best recipes in the book! (P.S. : Recipe works beautifully in a 3 1/2-quart Le Creuset Braiser). Photo by Richard Swearinger. Last summer, I did a make-ahead menu for a great summer dinner party, and a reader asked if I would do the same for the cold-weather months. Well, here it is! 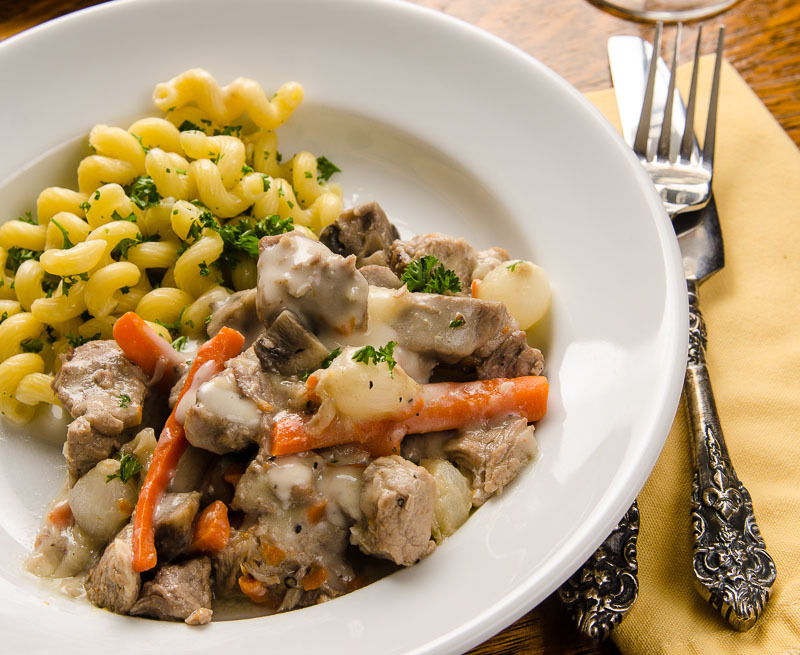 • Make the Blanquette Stew through step 2. Refrigerate the pork and the vegetables separately. • Make the Profiteroles, but don’t fill them with the ice cream. They freeze BEAUTIFULLY! 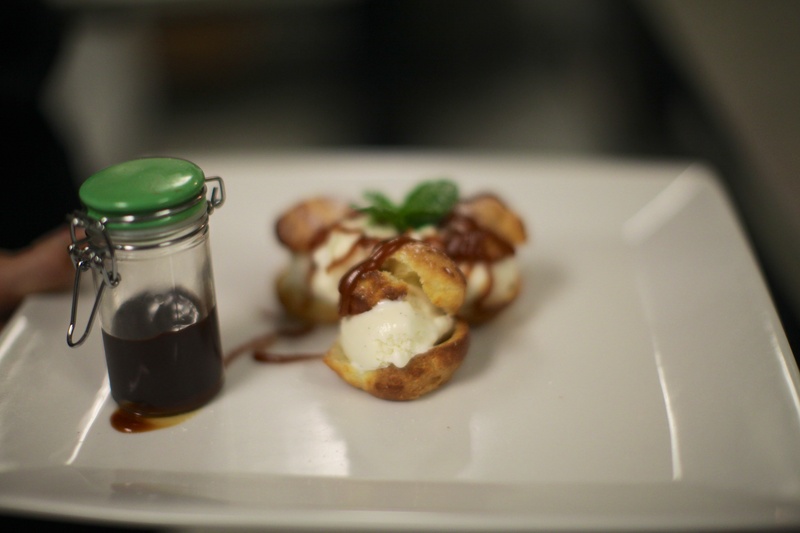 • Make the caramel and chocolate sauces for the profiteroles (or buy great-quality sauces) (Trader Joe’s sells a lovely salted-caramel sauce that will work beautifully). You’ve got the bulk of the work done right there! 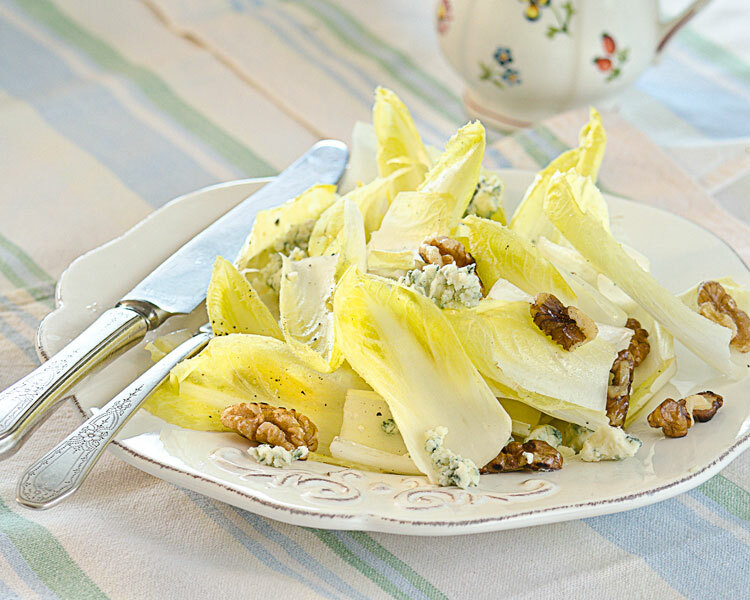 Belgian Endive Salad with Blue Cheese and Walnuts. A great salad for winter. Photo by Richard Swearinger. • Prep the endive leaves for the Belgian Endive Salad with Walnuts and Blue Cheese. Wrap in paper towels and refrigerate until ready to use. • Prep the dressing for the salad. You can let this stand at room temperature if serving within 2 hours. Otherwise, refrigerate and bring to room temperature before serving. • Get the Any-Night Baked Rice going. Once it’s finished, it will stay warm for a good half-hour or so if you keep it covered in a warm place. Profiteroles. Serving the chocolate sauce in a little jar is optional, but cute. Photo by Andy Fjellman. • Finish the Blanquette stew. At this point, it will be easy to de-fat the pan liquid, as the fat will have solidified–just spoon it off and discard. Bring the pork and pan liquid to a boil and continue with step 3. • Keep the Blanquette and rice warm while you serve the salad. • Warm the dessert sauces, fill the profiteroles with ice cream; serve. • Pour more wine, enjoy your friends. And enjoy the accolades.